Home | Articles | Is Google DNS Better Than Your ISP’s? Recently, Google introduced their own DNS service for internet customers. With the latest iteration of their service, along with OpenDNS and a few other DNS Service providers, they have started to use CDN’s (Content Delivery Network) to increase performance. This helps latency issues that your ISP is typically unable to address by gathering and using data stored on DNS servers based on the requestor’s location. Previously, depending on which service you were using, if you were in Portland, Maine you could theoretically be reaching out to a server in Portland, Oregon for DNS information. This great distance, along with server and network latency means that a user may be waiting longer than he or she needs to for the browser to retrieve the information it needs to show the website. Just in case you didn’t know what DNS is, it turns human readable domain names like computingondemand.com into IP addresses that networks recognize like 172.10.29.9. To test how your ISP’s DNS performs, you can download a utility called Namebench. Not only will it tell you how your ISP’s DNS is performing, but it will also tell you what your fastest option is. In my case, not only did it tell me that my ISP’s DNS was slower than some of the free options out there, it also told me that Google DNS was the fastest option for me. 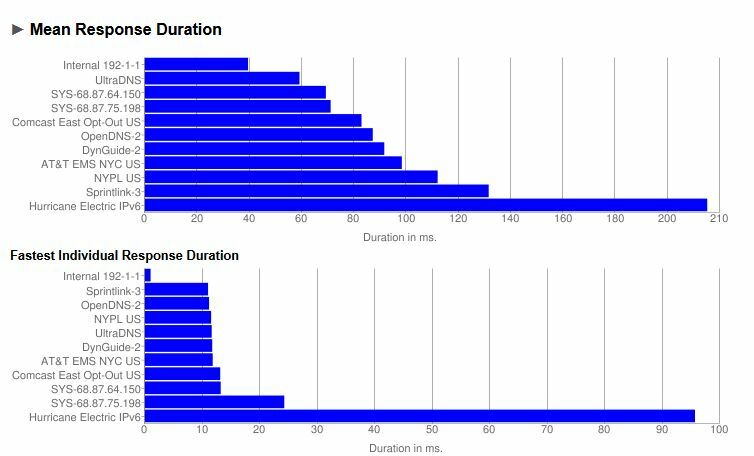 The results from the Namebench benchmark test show that Google DNS responds in about 40ms whereas my ISP’s DNS takes more than double that time. In the results, are other top DNS contenders too, should you decide that you want to rely on more than one service for DNS. So what does switching to Google DNS mean for you? It means that you will potentially spend less time waiting for your browser to find websites. This doesn’t do anything for download or upload speeds though, that is all on your ISP to take care of. What should you do now? Download the utility and see what your fastest option is… then come back here and tell us about it.